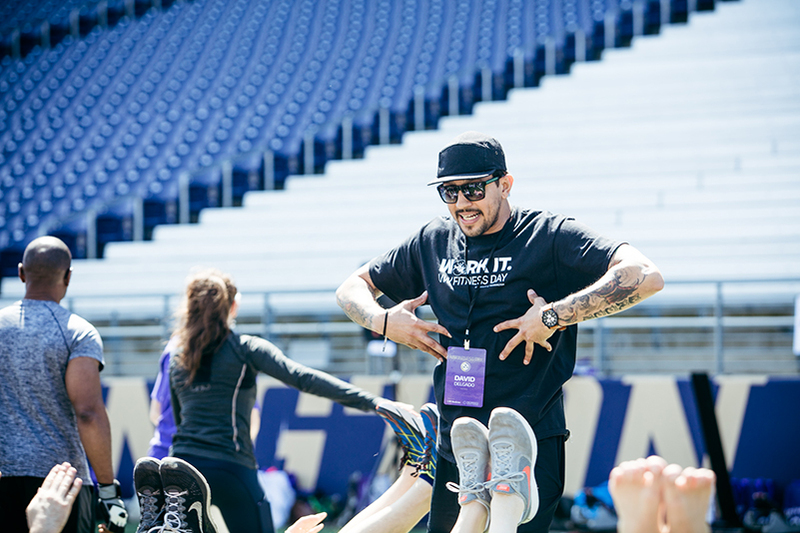 Celebrate What Moves You at UW Fitness Day May 8! Posted on April 8, 2019 by Matthew Leib. 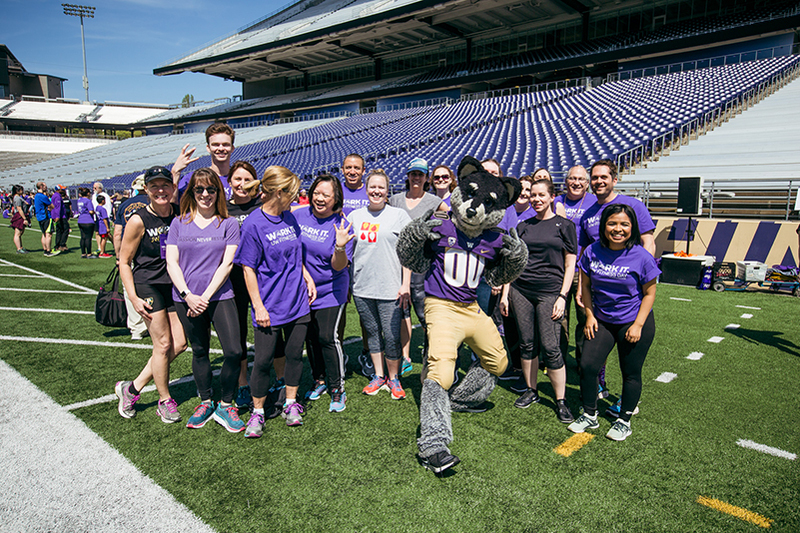 This entry was posted in Being Active and tagged Being Active, UW Fitness Day. Bookmark the permalink. “Thank your body for giving you this opportunity to move. Calling all Dawgs! 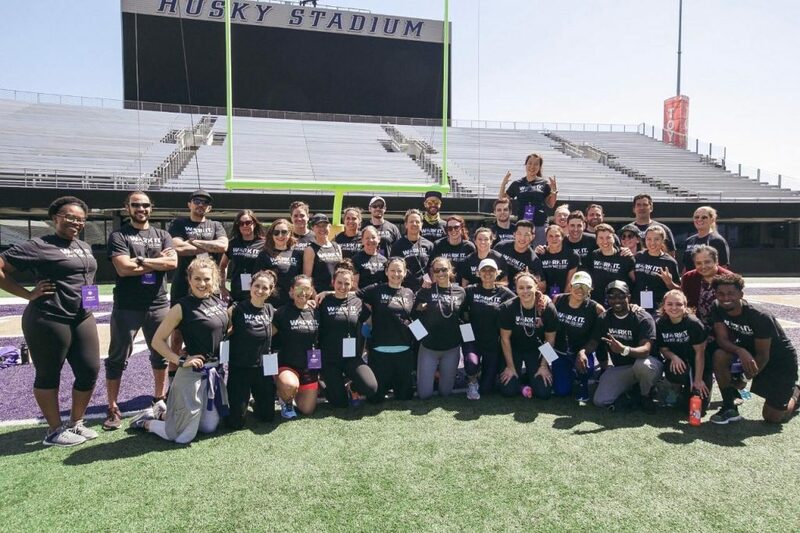 The Whole U is thrilled to invite you to participate in our third annual UW Fitness Day event on-field at Husky Stadium on Wednesday May 8! 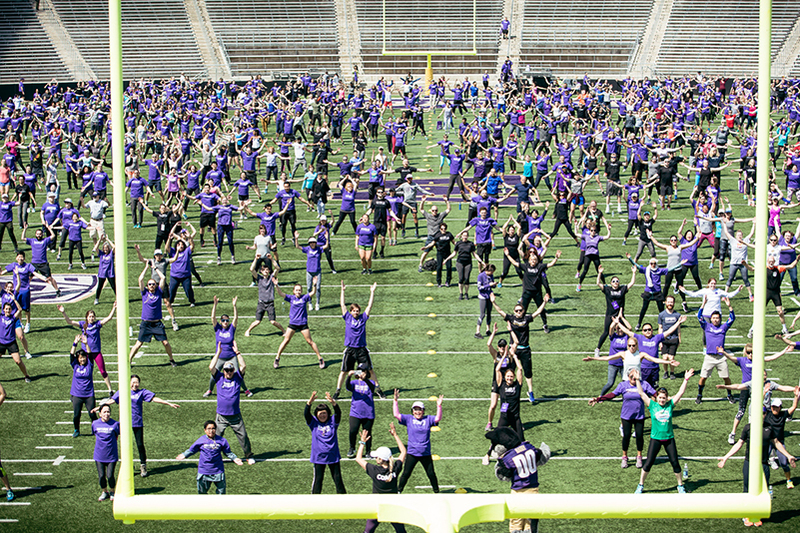 Held in recognition of Global Health and Fitness Month each May, UW Fitness Day offers members of the UW community a chance to come together and explore many forms of movement. 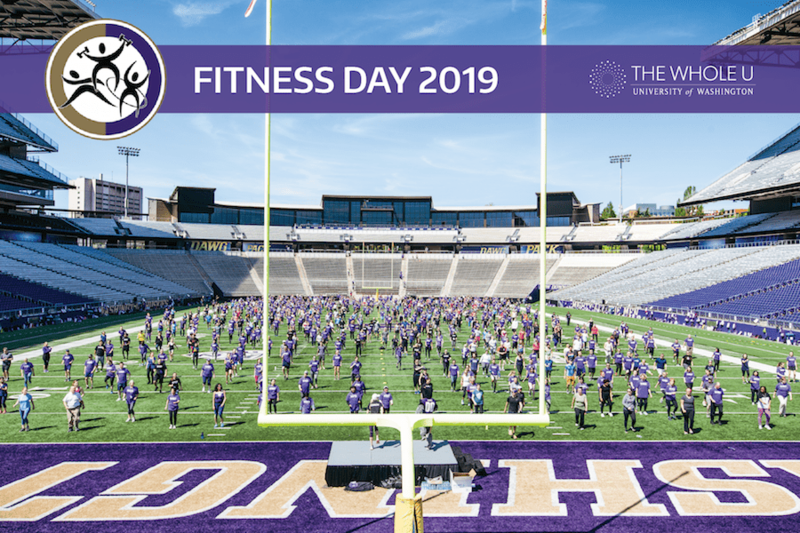 “We’re trying to show people that you don’t need to have equipment to exercise,” Lauren Updyke, assistant director of The Whole U told The Daily in an interview in advance of last year’s event. 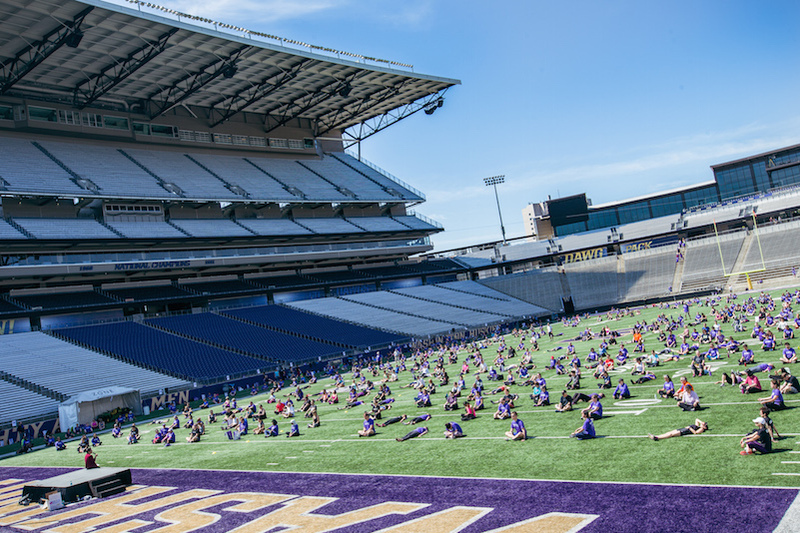 After stadium gates open at 11:3o am, participants can take the field where, at noon, they’ll be joined by UW Athletics coaches and student-athletes, UW Recreation instructors, and Whole U community fitness partners, who will lead 20 circuit training exercises, including cardio bursts, strength training, tai chi, yoga, and dance. We also listened to participant feedback from last year’s event and have decided to account for more time at each station—meaning more one-on-one time with coaches and colleagues! Coaches at each station will have modifications available so that participants can do as much movement as feels comfortable. All fitness levels are welcome and encouraged to participate! So gather your group and get ready to “Work It!” All who register and participate will receive a FREE T-shirt, a KIND bar, and additional swag and snacks from program sponsors! 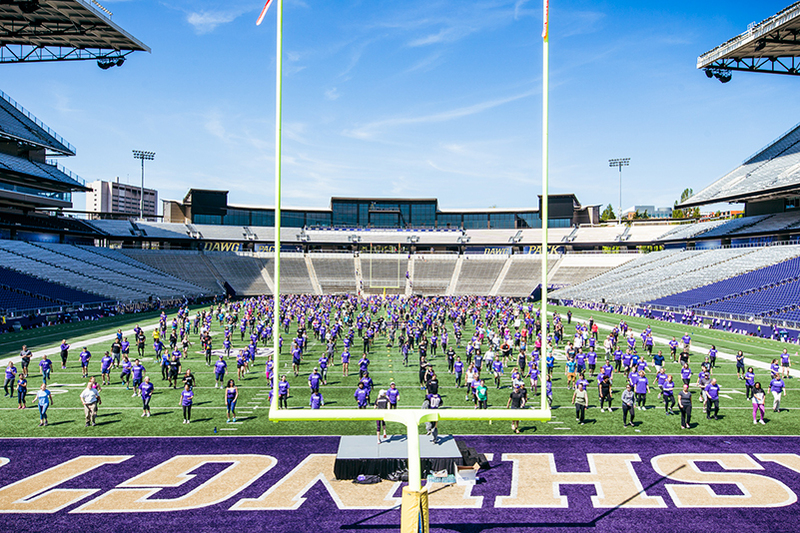 This year’s UW Fitness Day charity partner is Be the Match. 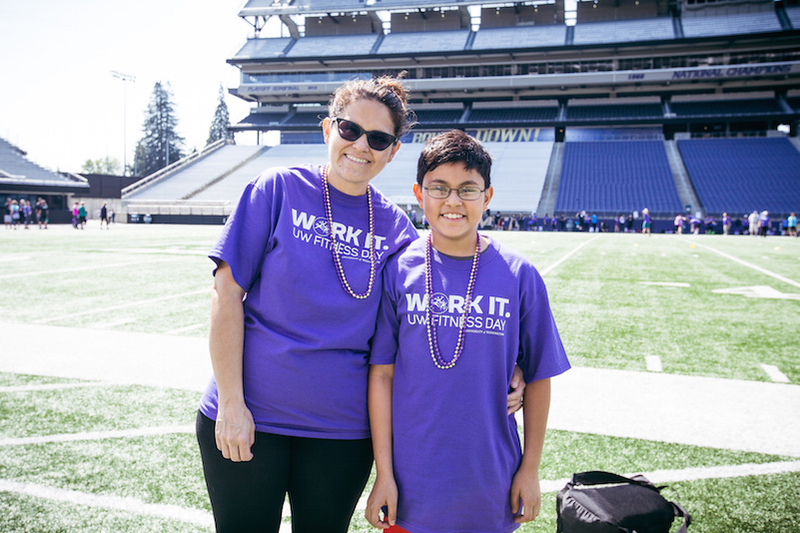 The University of Washington and Be the Match formed a formal partnership last fall and it’s our goal to have over 2,500 UW faculty, staff, and students join the nation’s largest marrow-donor registry and help save lives and combat health inequalities. 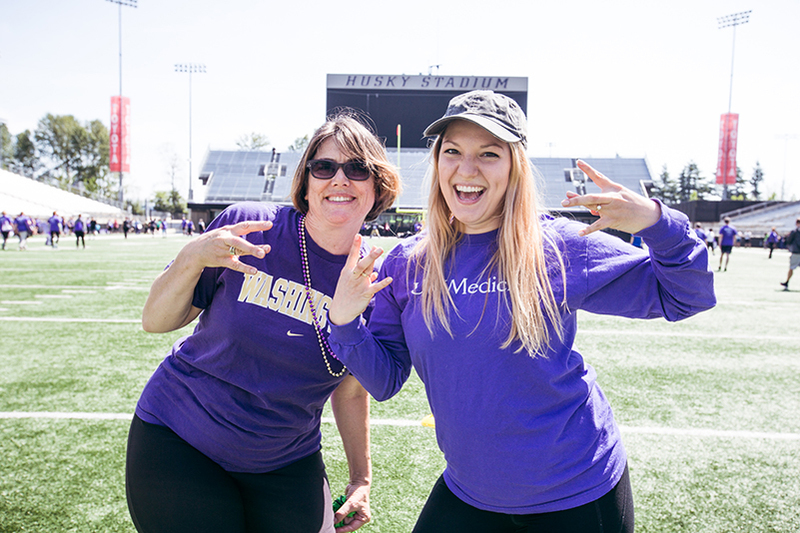 After the workout, be sure to stop by Red Square to “Get in the Game” and save a life at a block party with the UW Football team! Head down to the field for a closer look at last year’s action! Participants flashed “Dubs” and smiles before the workout got underway. 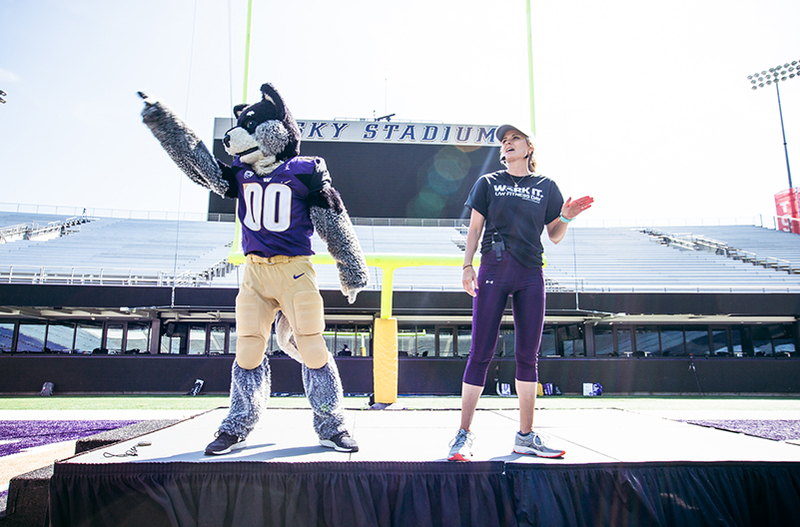 Harry the Husky was on hand to help host festivities before, during, and after the workout and meditation session. The Whole U’s own Lauren Updyke helped the crowd limber up to the uplifting lyrics of “This Is Me” from The Greatest Showman. 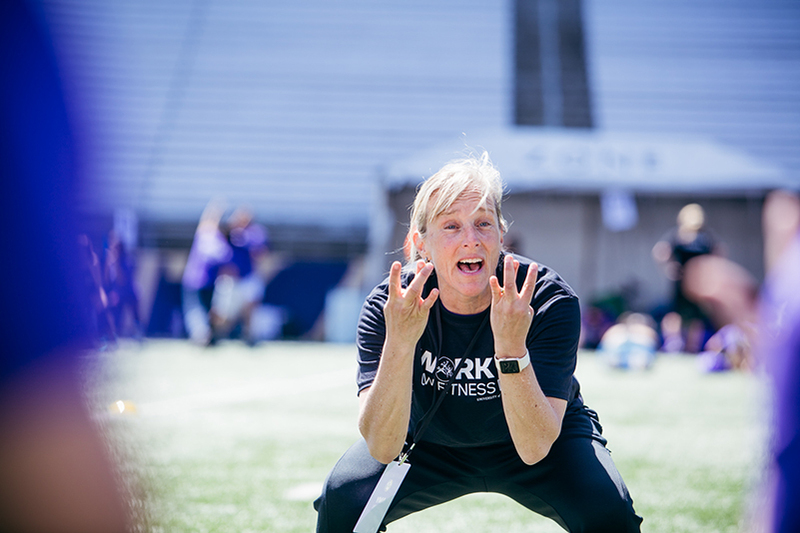 Associate Head Coach of UW Women’s Soccer Amy Griffin kept spirits high as she and UW Fitness Day participants dropped it low at the squats station. Coach David Delgado from IanFitness gives a boost of encouragement at the “crunches with legs in the air” station. 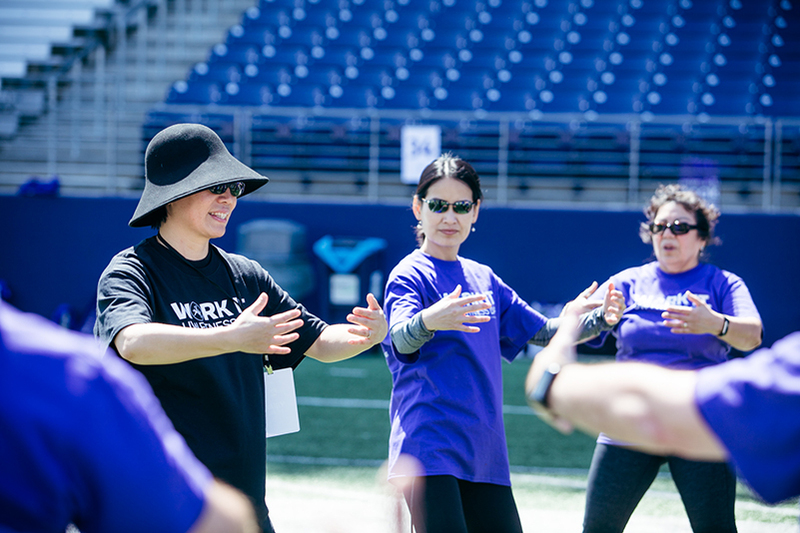 Master Instructor Yijiao Hong kept it cool with energy-channeling Tai Chi moves. 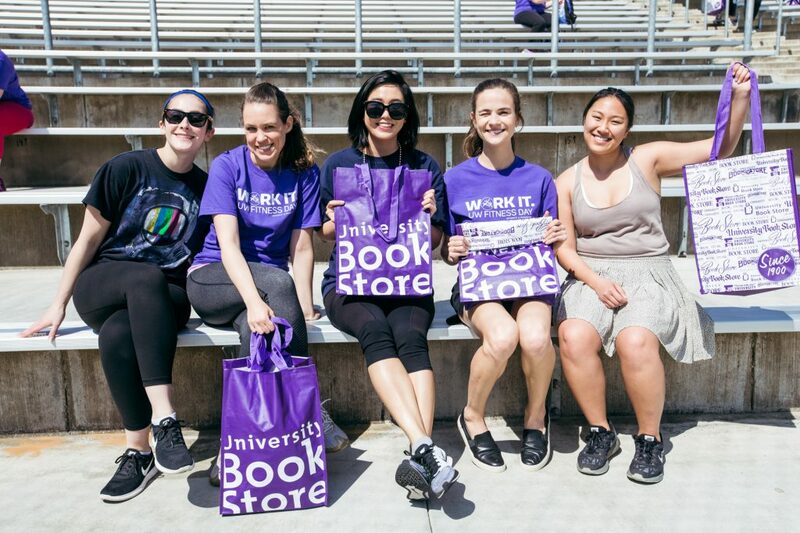 Attendees snagged swag courtesy of University Book Store, US Bank, and UW Medicine. Blue skies and temps in the mid-60s made for perfect conditions to WORK IT outdoors. Family and friends helped keep the atmosphere festive! 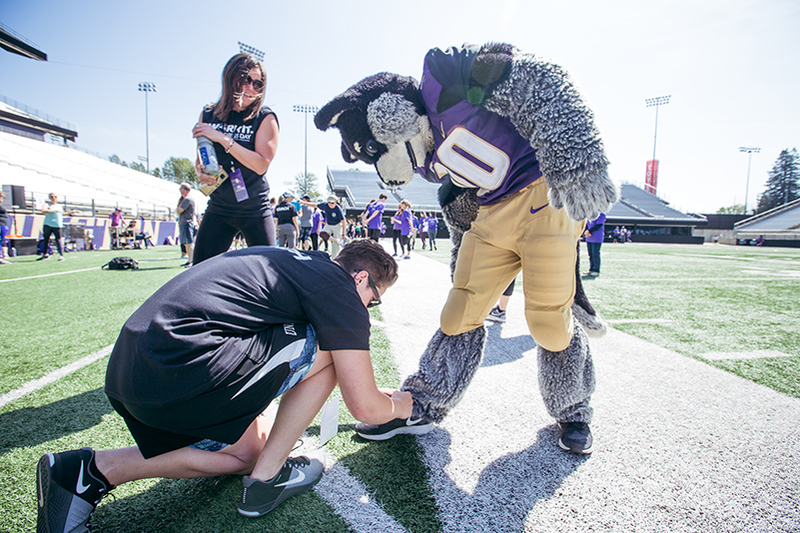 Harry the Husky gets help with a loose lace from an eagle-eyed coach before the workout got underway. Safety first!